Viktor Ageyev allegedly left military service a year ago. The Russian Defence Ministry has said that Russian national Viktor Ageyev, who was taken captive in Luhansk Region yesterday, is an active serviceman. "Viktor Ageyev never did contract service in the Armed Forces of the Russian Federation. According to the Russian Defence Ministry's records, Ageyev was conscripted into the Russian Armed Forces and afterwards left military service in May 2016, according to an established procedure. Reports about Viktor Ageyev's further enrolment into contract service in the Russian Armed Forces were made up by Ukrainian propagandists," it said. 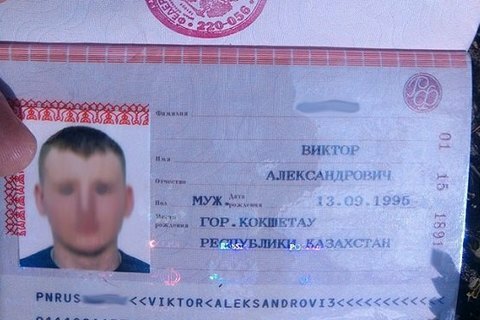 The BBC previously reported that Viktor Ageyev is a Russian contract serviceman. His mother, friends and former colleagues confirmed that after compulsory military service, he carried on in the army after signing the contract in March 2017. Ageyev said that he joined the contract service on his page in VKontakte social network on 1 April. The Ukrainian army killed two saboteurs and taken captive four more near Zholobok, Luhansk Region on 24 June. One of the killed ones was career Russian officer Aleksandr Shcherbak. Viktor Ageyev was taken captive. Two years ago, Russia reacted exactly the same way when special troops officers Aleksandr Aleksandrov and Yevgeniy Yerofeyev were taken captive in eastern Ukraine. A year later they were exchanged for Nadiya Savchenko.